We are now coming into the final month of autumn, and this is the optimal time for planting your veggies. Anyone who has attempted to create a ground level veggie patch will no doubt have experienced the inevitable back pain and frustration of compacted soil. 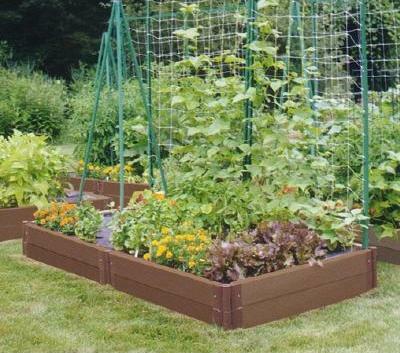 For this reason I have provided a step by step guide to building your own raised garden bed that allows you to bring in quality soil that is at a comfortable height. It is important not to use treated timber in this application since the chemicals can affect the edibility of your garden produce. For the ecologically conscious JBHT (Johnson Bros’ timber yard attached to the Mona vale branch) offers a section of plantation grown hardwood that is perfect for in ground applications. Start on a flat surface with one piece of 100 x 100mm and one 2400mm length of 50 x 150mm timber. Lay the 2400mm length on its thin edge and fix the 100 x 100mm length perpendicular to it at one end with two 75mm screws. Fix another 100 x 100mm length at the opposite end in the same fashion. Repeat this with a short length at each end before adding the next two layers of each side. Once all lengths are secured there should be a 150mm length of 100 x 100mm timber protruding from each corner. Flip the bed and move into place so that these protrusions are supporting it. Mark the position of each leg in the soil and then dig a 300mm deep hole for them to slide into. Once the bed is in place, line the ground inside it with mesh in order to keep out burrowing rabbits. Next comes the animal proofing to prevent birds and possums from attacking your crop. Fix the four pieces of 25mm PVC at even spacing on the inside of the 2400mm lengths using two pipe brackets and four 50mm woodscrews per piece of pipe. Fill your bed using high quality soil, and then place the 12mm pipes across the width of the bed by inserting each end into the 25mm pipes. Throw your bird netting across the pipes and you have a pest proof garden bed that is ready for planting.